Lately I've been thinking about soda bread. Sure, St. Patrick's Day is coming up in a couple of months but that really wasn't why. I've just been finding myself in the mood to make some or, more specifically, to eat some. 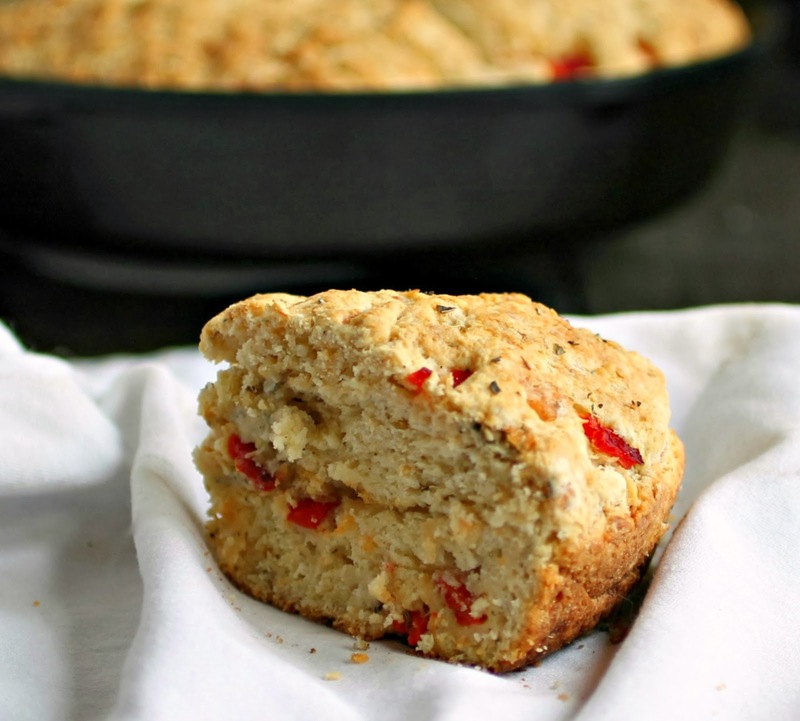 I really like my recipe for Simple and Sweet Irish Soda Bread but I'd never tried any variations other than the typical addition of raisins or currants. But why couldn't it be more savory? Unfortunately, Brian doesn't share my normal enthusiasm for soda bread which is probably why I don't make it more often. But maybe if I gave it more flavor and served it with something like soup or stew? It took a few rounds of experimentation to find the right balance of flavors, seasoning and moisture but the result was so fragrant and flavorful. I still haven't converted Brian but I loved it with soup for my lunch and again with some simple eggs at dinner. And I found some other soda bread enthusiasts who appreciated my leftovers. Enjoy! If you're roasting your own bell pepper, like I did, turn the burner on your stove to medium, place the pepper on the flame and rotate it until it's charred on all sides. You can use a long fork or tongs to move it around. Let it cool and then peel away the blackened skin (it doesn't have to be perfect) then seed it and cut into small pieces. Add the flour, baking powder, salt, baking soda, black pepper, oregano and butter to a large bowl and use a pastry cutter or fork to incorporate the butter. The mixture should resemble course crumbs. In a separate bowl, whisk together the eggs and buttermilk and add it to the flour mixture. Combine the dough, using a large spoon or spatula until it's almost incorporated, add the roasted pepper and cheese and finish mixing. Kneed the dough with your hands for a few minutes until it comes together and transfer it to a greased cast iron pan. Using the back of a knife, score the bread into four to help prevent it from bubbling up in the center. Bake in a pre-heated 400 degree oven for 30 - 35 minutes or until the bread is a light golden brown. Serve warm. Makes approximately 8 servings. 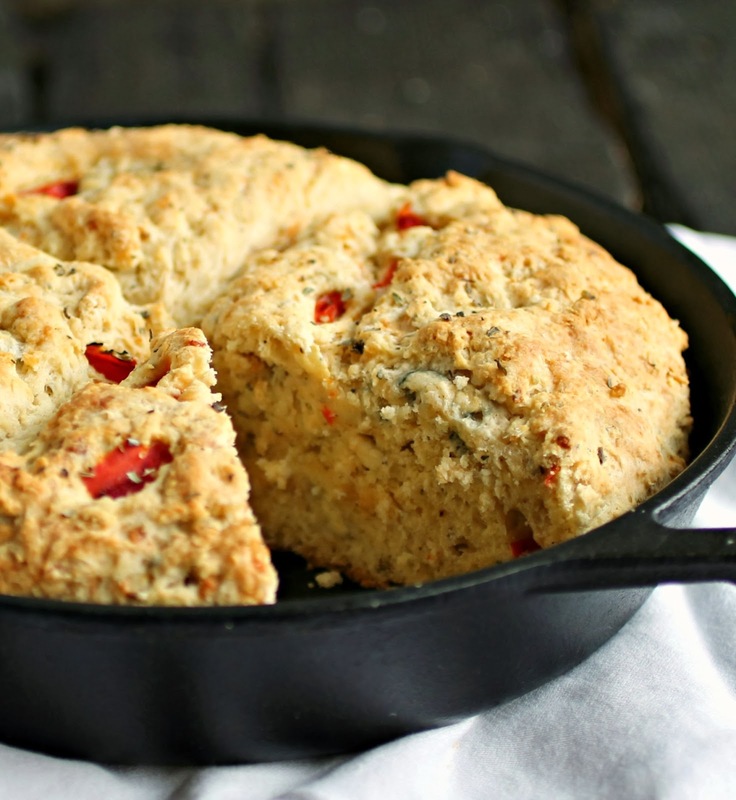 Mmmmm........this looks great and nothing tastes better than bread made in an iron skillet! 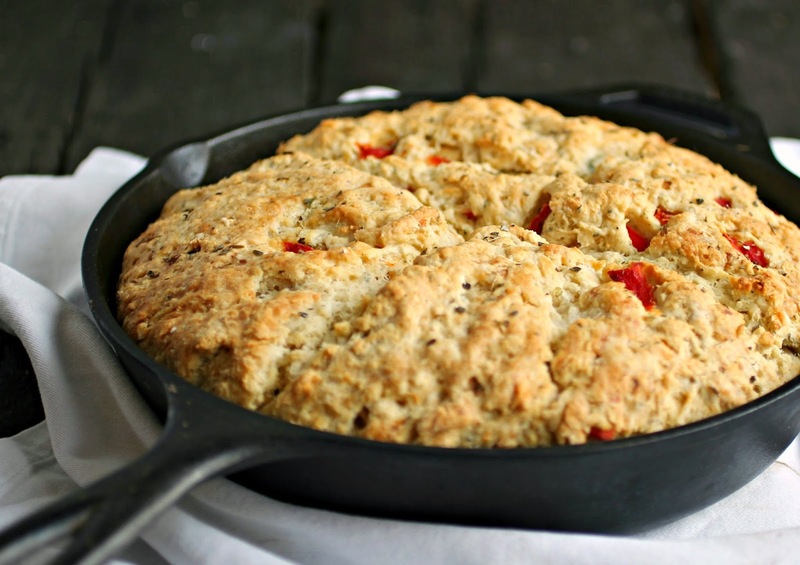 I always thing soda bread is kind of blah. I don't think I have a good recipe just yet. I love the extra flavors in this recipe. I will have to try it. I am thinking this was a bowl of chili would be a great meal. 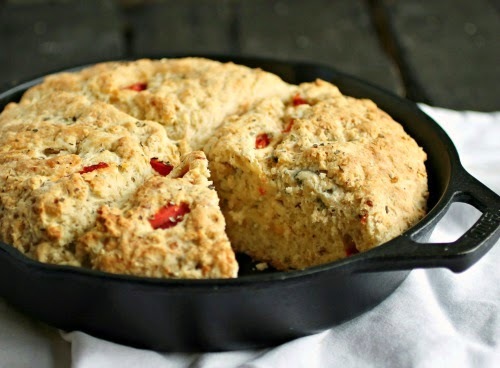 Although I love traditional soda bread, I must say you have a great idea here by making it more savory.